Ezekiel 4:9 Sprouted Grain Bread is made with some of the purest ingredients in the world. Perhaps they’re so pure that they come from a higher power? Maybe the Holy Grain itself? Sponsored ad for Instagram and Facebook. Point of purchase decal. Shoppers will see the bread slab decal of the six Grain Commandments on freezer doors, as Ezekiel bread is sold in the freezer aisle. The website for the Church of the Holy Grains. 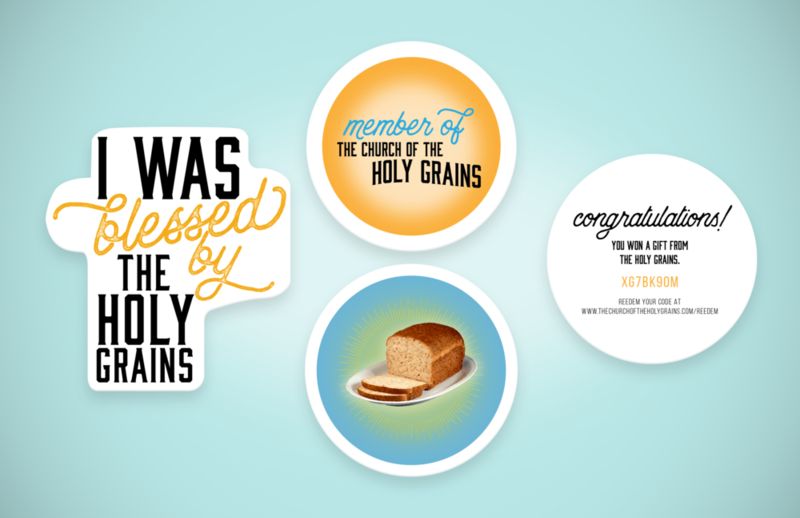 On the website, customers could become a member of the Church of the Holy Grains to gain access to coupons. On the website, users could ask the Holy Grain questions, like: why am I always hungry? On the website, users could ask the Holy Grain questions, like: how do I tie a tie? People would be able to redeem their free gift sticker for one of these items. As a product extension, Ezekiel 4:9 would sell toasters that toast divine images and words onto the bread, such as: blessed be these grains.